The portrait process is more than mere documentation and is as much a revealing record of the photographer’s needs as an artist. This bombastic return to what Henry Moore called ‘the tireless motif of mother and child’ masks a much more complex, syncretic representation. Beyond its requirement as a conventional portrait it is a continuation of my search for an unknown mother projected onto all my work. BIRTH balances the influence of centuries of art history with high camp photographic parody. It is both iconic and iconoclastic and perhaps can be considered as a vulgar appropriation of religious dogma for the 21st century but it is not merely a childish punk insubordination to the hetero-normative state. It is a demand on behalf of queer communities to an equal right to the sacred. The image forms part of the argument that the Immaculate Conception is a queer event. 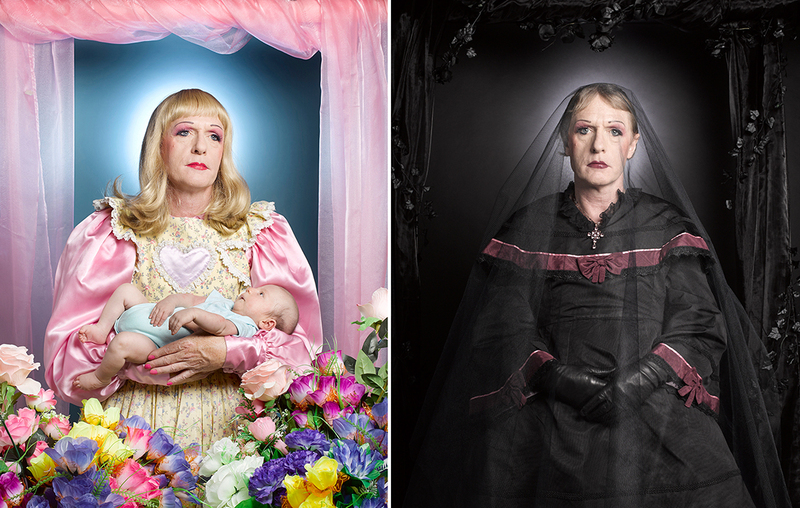 This portrait is a culmination of 6 years working with Grayson Perry on photographic strategies. Ansett met Perry for the first time at the Tate Modern and that portrait was immediately acquired by the English National Portrait Gallery. Ansett has worked with Perry every year since developing photographic strategies to promote his documentaries of contemporary British life and this new definitive image is the culmination of that relationship. The image was always planned to exist beyond its original purpose and the 1.3 m lightbox of BIRTH has shown in a perfect synergy at the Fitzrovia Chapel and has since shown at FORMAT Photographic Festival. ‘BIRTH – A Portrait of Artist Grayson Perry’ has won 1stprize at the prestigious Sony World Photography Awards for a single portrait.